276 p., 14,8 x 20,5 cm. With contributions by Andreas Arndt, Manfred Baum, Martin Bondeli, Markus Buntfuß, Marion Heinz, Petra Lohmann, Angelica Nuzzo, Violetta Stolz, Pierluigi Valenza, Rainer Wisbert and Günter Zöller. 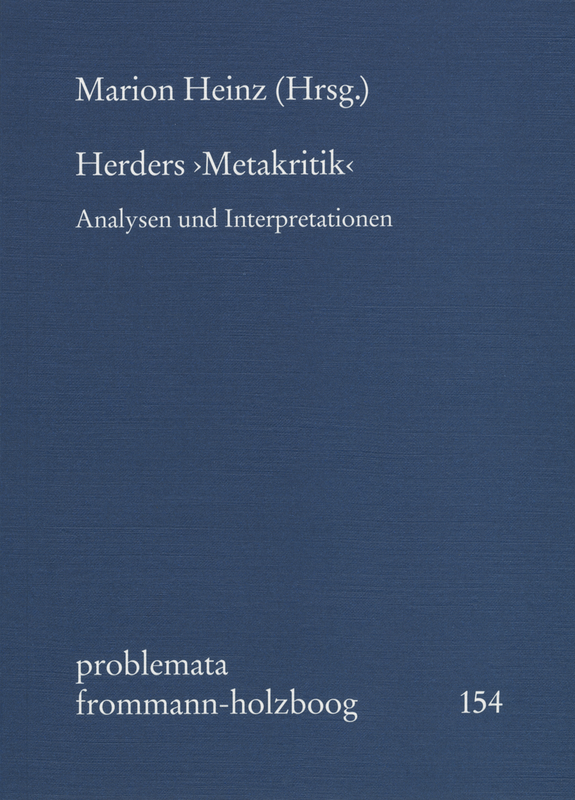 Herder’s ›Metakritik‹ (Metacritique) from 1799 is a general attack on Kant’s ›Kritik der reinen Vernunft‹ (Critique of Pure Reason) and the incipient Kantianism at the University of Jena, to which Herder obviously believed that Fichte’s philosophy belonged. Among his contemporaries, this work was not beneficial to Herder’s reputation as a philosopher. Posterity however has a completely new appreciation of Herder’s linguistic critique, based on Hamann, of a critically revised metaphysics as a preparation for the linguistic turn in 20th century philosophy and is interested in the approach of a holistic naturalism and its unexploited potential. The essays in this volume attempt to make the different lessons in this volume transparent and shed light on the context of the origins and the impact of this work, which has been neglected for such a long time.